"Les jours je songe, les nuits je rêve"
12-14H: Abandonned relicts of the Sonic Sleep Event "Les jours je songe, les nuits je rêve"
Sleep is indispensable for humans and has great significance in everyday life as well as culturally. Study of sleep phenomena has been around since the early days of cultural history. In both the visual arts as well as in music and poetry numerous artistic works testify to this. From a cultural-historical point of view, sleep was temporarily devalued by capitalist society as it was seen as time lost to productive and profitable action. However, in the arts, sleep, as well as the states of leisure and daydreaming, were used to become receptive to inner images, emotions and thought processes.Through sleep, which usually takes place at night, mankind is in contact with the planetary processes of day and night that result from the constellation of the sun and the earth. Sleep as a part of nature has become the subject of scientific research. 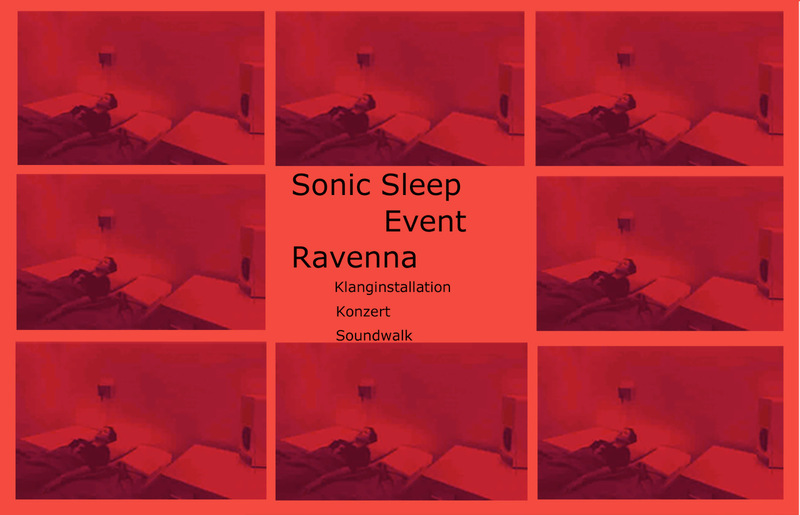 In sleep laboratories and apps, body functions and the duration of sleep phases are measured and evaluated on a neuroscientific basis.The sound installation "Les Jours je songe, les nuits je rêve" by Jutta Ravenna, on the other hand, conceives sleep as an artistic action. She takes up her own position in relation to sleep, understands it as a reaction to the society-related avoidance of leisure, daydreaming and dreaming and wants to give it it’s deserved attention.